Let’s start by reviewing what exactly makes up our short list of collision avoidance techniques. Then we’ll talk about when and where you can practice those skills. 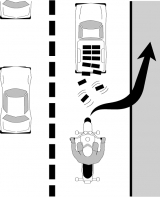 As motorcyclists we can avoid danger by moving our bikes in basically two ways. The first way is by either moving faster or slower along our path of travel. By doing that we alter our rate of travel by speeding up or slowing down; rolling on or off the throttle or braking. For most of us that’s something that we do naturally as we ride. We continually adjust our speed as we travel along any road. The heavier the traffic, the more we adjust. When we have to react suddenly to danger, this change in speed can be viewed as an evasive maneuver or collision avoidance. The other way we can avoid danger is by moving from side to side. Again something we normally do in small increments, as we routinely avoid objects that we anticipate, since we can see those hazards from a long way down the roadway. When we have to react much more quickly to danger, we again fall into the realm of evasive maneuvering or collision avoidance. This Kaution Korner will focus on two techniques that we can easily practice – Quick Stops and Swerving. There are a number of sources for this discussion, but I will draw primarily from materials published by the Motorcycle Safety Foundation and various state motorcycle publications as well as David Hough’s books on Motorcycle Safety. Good braking skills are an important part of our riding repertoire. Remember that good braking requires the use of both brakes. To help train your mind to react automatically in an emergency it’s a good idea to always use both brakes whenever you stop. All of our bikes respond somewhat differently to braking inputs, so we owe it to ourselves to constantly practice braking. Always pay attention to feel and the feedback that your bike provides to you when you brake. Try varying pressure and work at getting a feel for both front and rear controls. It will also help you to identify any changes in braking response which may signal a brewing mechanical problem. If it doesn’t feel right, it might not be right. Please keep in mind that there is a difference between a quick stop and a panic stop. A quick stop is a controlled reaction to a dangerous situation and it allows us to stop as quickly and safely as possible. There are two words that you should associate with using your front brake in a quick stop – firm and progressive. In contrast a panic stop is defined by grabbing the front brake as hard and as fast as you can. A panic stop is often followed by a low side crash and many riders will attempt to tell others how they had to lay the bike down, when in reality they panicked and grabbed the front brake. That over breaking caused the front tire to lose traction and skid and that loss of traction usually results in a low side crash. The key to stopping quickly is to apply both brakes fully without skidding either wheel. Simultaneously squeeze the front brake lever and press down on the rear brake pedal. Remember to keep your body centered and look forward; that will help keep the motorcycle in a straight line as you brake. As you rapidly slow, the combined weight of the motorcycle and rider/passenger (the load) will shift the balance of weight forward, increasing the traction footprint of the front tire (contact patch) and decreasing the traction footprint (contact patch) of the rear tire. Be sensitive to this change. As mentioned earlier, for the front brake, we want to use firm and progressive pressure on the lever. That will prevent you from overbraking. Before the weight shift to the front tire (loading) happens, the progressively greater squeeze on the front brake lever allows you to take advantage of the increasing contact patch of the front tire as the load continues to shift forward under heavy braking. It is worth noting that the contact patch of the rear tire will decrease and that the rear tire will offer increasingly less traction for braking as the bike continues to stop. That will require you to either maintain or actually decrease your pressure on the rear brake pedal in order to prevent a rear tire skid. Every bike is different and that is why you need to know how your bike will react. I have ABS brakes on all of my personal motorcycles. When I practice quick stops one of my goals is to not activate my ABS. I want to keep on top of my braking skills and take my bike to its maximum braking limits without skidding either front or rear tire. I know I am not a perfect rider, so if I overbreak, if the road surface is not ideal or if my judgment is not tip top, then I have ABS to kick in and protect me. I think too many riders with ABS get complacent and stop practicing quick stops because they feel they can let the bike take control. In the event of an ABS system failure, a rider who doesn’t practice maximum braking techniques will have problems. You can practice quick stops any day of the year. Find a good empty parking lot and have at it. Vary your approach speeds and allow plenty of room for your stop. Also be aware that you are in a parking lot and other vehicles may decide to share the space with you. This is an activity that can be done as a group, so your friends can serve as your lookouts when you’re practicing. Here’s a link to a few suggestions about how to practice your skills in any parking lot using the parking lines as reference points. Years ago, I started teaching rider safety courses. One of things that amazed me was the concept of swerving and specifically one line that I’ve repeated hundreds of times since then has always stayed with me. “Research has shown that at speeds above 18 mph, a motorcycle can swerve to avoid a car sized obstacle in less distance than it takes to stop.” Now that’s a powerful statement! For me, it meant that slamming on the brakes wasn’t the only way to stay alive. I can guarantee you that by understanding the swerve, by practicing the swerve and by keeping the swerve in the front of my mind as a viable collision avoidance technique allowed me to be alive today. I was able to survive a potentially fatal situation by swerving in a situation where braking would not have had the same positive results. I firmly believe that without initiating that swerve maneuver I would have become another accident statistic. You may recall the definition of a swerve from your rider training classes. If not, the textbook answer is two consecutive turns or countersteers, one to avoid the obstacle followed immediately by another to regain your original path of travel. Of course whenever you swerve, you need to make sure that you have a clear area ahead you to swerve into. 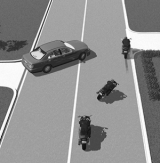 Your initial press to countersteer must be firm in order to initiate motorcycle lean and to avoid the danger. When swerving keep your upper body upright while the motorcycle leans. Keep your knees against the tank and your feet planted on your pegs or floorboards. Remember to keep looking toward the clear path of travel that you’ve selected. There are a few important things to remember when you swerve. Do NOT brake when you are swerving. Also there should be NO application of the front or rear brakes. Braking can also include engine breaking, so do NOT roll off the throttle. When you practice, work on keeping a steady throttle throughout the swerve. Swerving is something you can practice whenever you’re out riding. I practice my swerves all of the time and I’m sure cagers wonder what I’m doing. Remember the old saying, “If I have to explain, you wouldn’t understand.” Well . . . that applies here. There are lots of opportunities out there – man hole covers, potholes, tar snakes, etc. and you can practice swerving at many different speeds. If you haven’t practiced this maneuver in awhile, it would be a good idea to find an empty parking lot to practice in first. 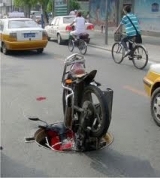 http://bitsandpieces.us/2011/08/11/manhole-vs-motorcycle/&h=694&w=625&sz=99&tbnid=VWsi0FiS_PvS0M:&tbnh=91&tbnw=82&zoom=1&usg=__hz0puIMoYD7qxCewc_U4jxphCPQ=&docid=fLwsnKMSXzatBM&sa=X&ei=7YGeUambNoauyAG2qoG4CQ&ved=0CGMQ9QEwEQ&dur=12562″>Remember that the best collision avoidance technique of all is to be aware of your surroundings at all times. Being able to search ahead of your path of travel and aggressively scanning ahead will allow you to see dangerous situations unfold well before those situations become problems that warrant emergency actions. Use the SEE strategy – Search, Evaluate and Execute – at all times. It’s too easy to get lost in the sea of thoughts and worries that makeup our hectic lives. When you ride focus on the ride and enjoy the moment you’re in.